For other uses, see Who Dares Wins (disambiguation). Who Dares, Wins (Latin: Qui audet adipiscitur; Greek: Ο τολμών νικά, O tolmón niká; French: Qui ose gagne; Italian: Chi osa vince; Portuguese: Quem ousa, vence; German: Wer wagt, gewinnt) is a motto made popular by the British Special Air Service. It is normally credited to the founder of the SAS, Sir David Stirling. Among the SAS themselves, it is sometimes humorously corrupted to "Who cares [who] wins?". The expression appears in a medieval Arabic book of fairy tales translated and published in 2014. 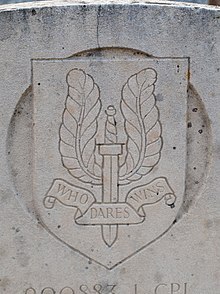 The catchphrase "He Who Dares, Wins" was commonly used by Del Boy in British sitcom Only Fools and Horses. The motto has been used by twelve elite special forces units around the world that in some way have historical ties to the British SAS. An early statement of the idea is 'τοῖς τολμῶσιν ἡ τύχη ξύμφορος' ("luck favours the daring") from the Ancient Greek soldier and historian Thucydides. Latvia Latvian Special Tasks Unit Latvian: Drošais Uzvar! Belgium 1st Parachutist Battalion During the Second World War, many of its personnel were part of the British 5th Special Air Service and retained the SAS badge, motto and traditions. ^ Tsouras, Peter G. (2005-10-24). The Book of Military Quotations. Zenith Imprint. p. 110. ISBN 978-0-7603-2340-3. Retrieved 5 May 2011. ^ Ferguson, Amanda (March 2003). SAS: British Special Air Service. The Rosen Publishing Group. p. 12. ISBN 978-0-8239-3810-0. Retrieved 5 May 2011. ^ Thompson, Leroy (1994). SAS: Great Britain's Elite Special Air Service. Zenith. p. 9. ISBN 978-0879389406. ^ al-hikayat al-'ajiba wa'l-akhbar al-ghariba [Tales of the Marvellous and News of the Strange]. Translated by Malcolm C. Lyons. Penguin. 2014. p. 76. ISBN 9780141395036. ^ "Infanterie Offiziersschule 10". www.vtg.admin.ch. Retrieved 2019-04-10.